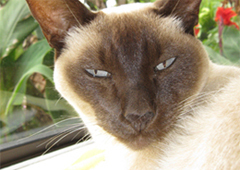 When my Siamese cat Athena aged 13yrs began to suffer from colon problems, my background as a vet-nurse and my love of natural medicines, drove me to look for an alternative to tedious weekly visits to the vet, as this was offering no hope of a recovery and Athena's future was looking bleak. I was determined to find a vet who would understand Athena's medical problems and treat her homeopathically.... thankfully, I found Dr Barbara Stumbles. With her experience and dedication to animal health, Dr Barb very quickly prescribed a homeopathic remedy which started to work straight away. As I live in rural northland, we had weekly phone calls or progress reports by email and after just three months, Athena is now healthy and happy again. We just can't thank Dr Barb enough and highly recommend her... she really cares and sure knows her stuff !!! ....Becky Friend. 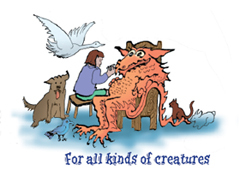 "I was very impressed with Barbara's holistic and thorough approach to diagnosing Tinks' stress related skin condition. 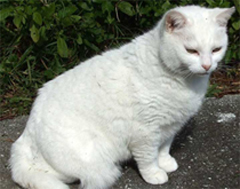 After only one dose of the prescribed homeopathic remedy, the large hole in Tinks' fur started to grow over and she seemed less nervy and more settled within herself. As you can see from her photo taken three months later, the fur is now fully restored and she is one happy and contented cat!." In January 2010 my family and I rescued a highly traumatized kitten from the bush. Since then she has had ongoing medical problems and required frequent veterinary visits. About a month after her rescue and spaying, she started to self mutilate herself. Despite constant veterinary treatment to cure her and prevent her from scratching huge gashes into her neck, nothing seemed to help her. 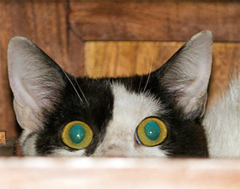 She was a terrified cat who shunned human contact and spent all of the time hidden away in a desk drawer. Eventually, I approached Barbara Stumbles and asked her to help our cat. After an initial 60 minute consultation, when Barbara gave our cat a thorough examination and took a highly detailed history, she started a series of homeopathic treatments. These ranged from stress and trauma therapy to various treatments for allergies, to combat fear and to enhance her general health and wellbeing. Barbara kept in close contact throughout all of her treatment, phoning regularly and offered advice, support and ideas. In a matter of months, our cat has gone from being a terrified creature with a bleeding mutilated neck to a sleek glossy cat who is lovable, approachable, playful and with a "full neck of hair"! 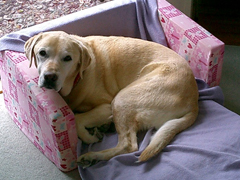 My labrador Flippy suffered from serious health problems that had been treated with conventional medication. One of these drugs caused a nearly fatal reaction and this very scary incident prompted me to search for a veterinarian who was able to treat her in a holistic way. Luckily we found Dr Barbara Stumbles who has a vast knowledge of both, conventional and alternative medicine. Barbara has a very caring nature and always puts the patient's well being first. She dedicates of lot of her time to find the best solution for the individual health issue and any treatment plans are openly discussed. Her dedication and helpfulness in the most unusual cases is highly commendable.